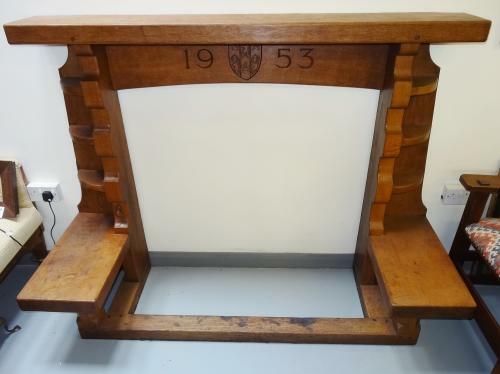 A truly unique, rare and important piece of Robert (Mouseman) Thompson furniture in the form of a superb large fireplace in seasoned English oak, made in 1953 with carved date and family shield crest of stags`s heads and stars, belonging to the Ropner Family of Yorkshire. Approx 66" wide at top, 69" wide at base seating ledge, 51" high, projection 25". Opening approx 44" wide by 40" high. According to the Robert Thompson archives (and our thanks to the kind assistance of the archivist there), this was the ONLY fireplace made in that year, 1953, the Queen`s Coronation Year. It was part of a larger commission by the Ropner family of Patrick Brompton, Yorkshire, including an octagonal table, sideboard and chairs. The original cost of the fireplace was estimated at between £40 and £50. The original drawing for this is held at the Mouseman Archives. A member of the Ropner family, Emil Hugo Oscar Robert Ropner (born 1838), originally came from Prussia to West Hartlepool in the North East of England back in the 19thC, around 1857, when he was 19 years old, a town he knew nothing about. He then set about working for a coal exporting company, married, named his first ship the Amy – after his daughter – and seemed to do very well for himself. In 1874 he founded the Ropner Shipbuilding Company in Hartlepool, primarily to construct and operate what became known as tramps. Ropner’s, also established a shipyard in Stockton and became one of the biggest and most successful trading companies in the country. He was knighted in 1902 and made a baron two years later, Robert also gave the land for what became known as Ropner Park to the people of Stockton. The shipping dynasty continued to expand and multiply, buying three estates – Thorp Perrow, Camp Hill and Patrick Brompton; near Bedale in North Yorkshire, the area where many of the family still live.